The superfood acai (pronounced ah-sigh-ee) is known to be packed with antioxidants – 10 times more antioxidants than red grapes, helps combat premature aging, and contains good amounts of iron, calcium, fiber, and vitamin A.
Wow. Let’s just have it for breakfast, lunch and dinner already. Looking like a blueberry, acai berries are difficult to harvest, and only around 15 percent are edible. 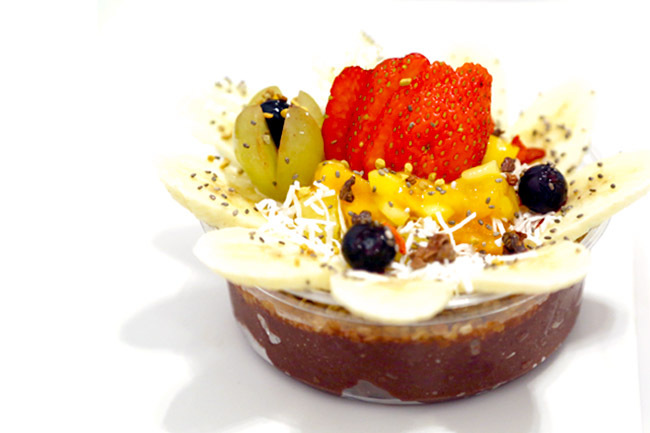 Acai bowls may be popular in Brazil, Hawaii and some parts of America, but hardly known to in the Singapore market. Unless you are a well-read health enthusiast. 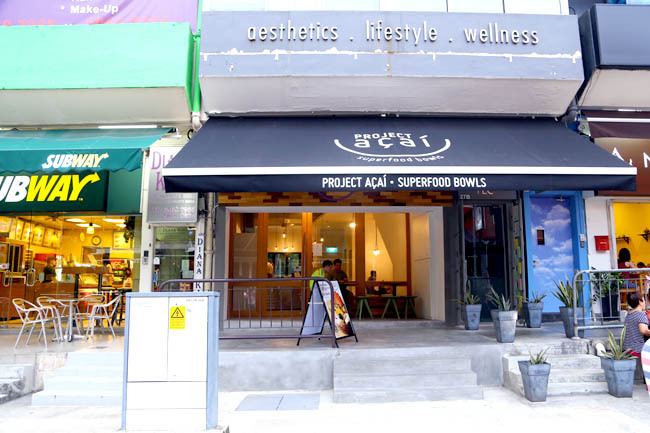 Project Açaí at Holland Village is Singapore’s first dedicated açaí superfood café, and serves Sambazon organic açaí which grows in the Brazilian Amazon Rainforest where the berries are hand harvested by local family farmers. Their menu consists of açaí bowls ($6.80, $9.30, $13.50) and smoothies ($8.50) – Beach Body To-Go, Yogi Wannabe-rry, Where My Chocolate Abs? Yes, just acai bowls and smoothies. No salads, no health drinks, no granola bars. Admire their dedication to the brand. The waiting time was about 10 minutes, but I did see the staff cut up the fresh fruits and arrange them meticulously right in front of our eyes. Such dedication. 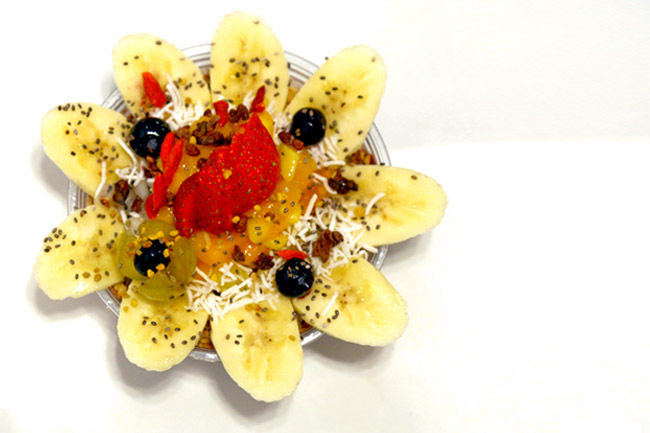 While health may not always be associated with taste, the Acai Bowl with an acai blended base topped with granola, blueberries, and other superfood such as chia seeds, goji berries, coconut shavings, raw cocoa nibs and bee pollen was a refreshing tasty ‘dessert’. The base had a thick smoothie-like texture, with a little sweetness, and the toppings added delightful crunches. The truth, I may consider having this rather than some overly sweet ice cream brands ANYTIME. I did wish to have an original taste of acai berries, only to find out that those on top were blue berries. 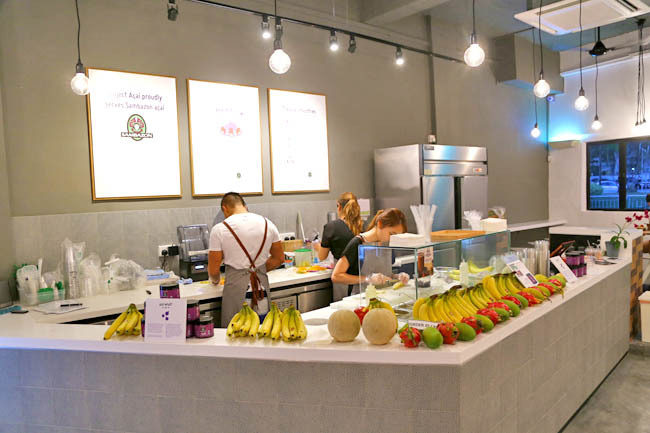 The café was moderately packed with expats and gym-goers in shorter than short shorts (even the guy who served us looked like a spornosexual – ah, just learnt that word), possibly all here to find their healthier alternatives. Bring it on, acai. ← 20 New Cafes in Singapore March 2015 – What’s Up With The Names?